Stoke clinched promotion to the Premier League as Leicester went down to the third tier of English football for the first time in their 124-year history. In a first half wrought with nerves, Ricardo Fuller came closest when Paul Henderson made a superb double save. Henderson denied Fuller after the break but Gareth McAuley's header hit the post as the Foxes poured men forward. 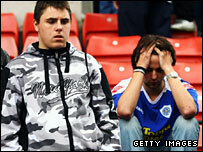 Carlo Nash saved brilliantly from Iain Hume and Richard Stearman, and a win for Southampton sent Leicester down. 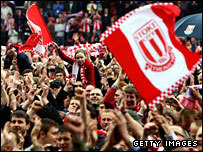 Stoke's fans invaded the pitch for a second time to begin partying, while the 2,000-strong Foxes contingent contemplated a dramatic fall from grace for their club. Four years after exiting the top flight, they face the prospect of a dogfight in League One despite an injection of cash in the past 12 months from owner Milan Mandaric. He was not present to witness Stoke, who needed only a draw, secure their return to the elite for the first time in 23 years. A predictably nervous first half featured more fierce tackling than clear-cut openings. Leicester's Steve Howard and McAuley were somewhat fortunate to escape with cautions for rash challenges on Andy Wilkinson and Liam Lawrence. Stoke carried the greater attacking threat and could have been in front 10 minutes before the break when following a long punt forward Henderson superbly parried Fuller's volley and saved bravely at the dangerous striker's feet from the follow-up. Leicester's midfield struggled to get up to support Howard and Barry Hayles in attack, who were left to feed off scraps. Hayles, who fired one effort woefully wide, at least forced Nash into a save - albeit a comfortable one - just before the break, when he shot on the turn. Stoke continued to enjoy the bulk of the possession after the interval but lacked composure in the final third. But, with news filtering through that Southampton had gone 2-1 up against Sheffield United, there could have been a hammer blow to Leicester. The ball broke to Fuller in the six-yard box following a long Rory Delap throw-in but Henderson somehow pulled off a fantastic instinctive save to keep his team level. From then on it was pretty much all Leicester, and they came agonisingly close when McAuley got a clean head on the ball from Matt Oakley's corner and hit the outside of the post. On a typical final-day roller-coaster of nerves, the visitors threw men forward in the knowledge Southampton were now 3-2 up. And they thought they had a penalty when Stearman was felled just inside the area but a free-kick was given and Hume fired over. Nash then produced stunning saves to keep out Hume's deflected strike and Stearman's header from the resulting corner. With play deep into time added on, some Potters fans invaded the pitch after hearing Ipswich had beaten Hull to confirm their elevation. The final whistle came moments after the resumption and Leicester's players trudged off past delirious Stoke fans who engulfed the pitch. "I have to say a special 'thank you' to the chairman. Peter showed a lot of character to buy this club and spent a lot of money on it. "This is a great day for this club and an opportunity for us to build and push on for next year." "It's a devastating day for all of us. Too many times this season we haven't done it, we haven't scored and the table doesn't lie. "Our character needs to be looked at, the overall team and squad. The fans have known it but we've let everyone down. "We have to hold our hands up, we were the ones with the responsibility and couldn't deal with it." Stoke: Nash, Cort, Wilkinson (Buxton 21), Shawcross, Dickinson, Lawrence (Pugh 90), Delap, Whelan, Cresswell, Fuller, Sidibe (Ameobi 90). Subs Not Used: Simonsen, Pearson. Leicester: Henderson, Stearman, McAuley, N'Gotty, Mattock, Bell (Ashley Chambers 90), Worley (Fryatt 85), Oakley, Hayles, Howard, Hume. Subs Not Used: Douglas, Clapham, Wesolowski. BBC Sport Player Rater man of the match: Stoke's Ricardo Fuller (8.17 on 90 minutes).